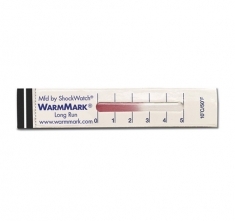 The ShockWatch WarmMark® Long Run is a cost-effective, disposable temperature indicator that monitors temperatures during transport and storage, indicating whether goods have been subjected to unacceptable conditions. Affixed directly to your products or their packaging, these reliable temperature indicators provide visual evidence of exposure to unacceptable temperature levels, allowing you to determine if product quality has been compromised. 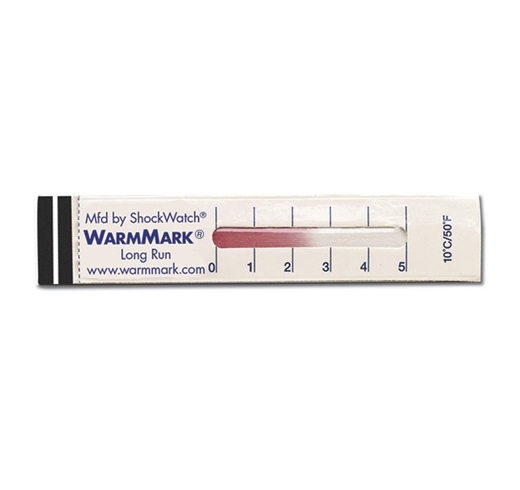 Use of the WarmMark Long Run can have a positive effect on your bottom line because it indicates a product’s long-term exposure to temperature excursions. If the window of the WarmMark Long Run indicator stays white, there’s no problem. But if the temperature climbs beyond a specific threshold, a red dye moves through the windows of the indicator with the passage of time. If the temperature returns to below the threshold, the dye stops its progression. In this way, handlers and shippers can know how long the product was exposed above the threshold temperature.